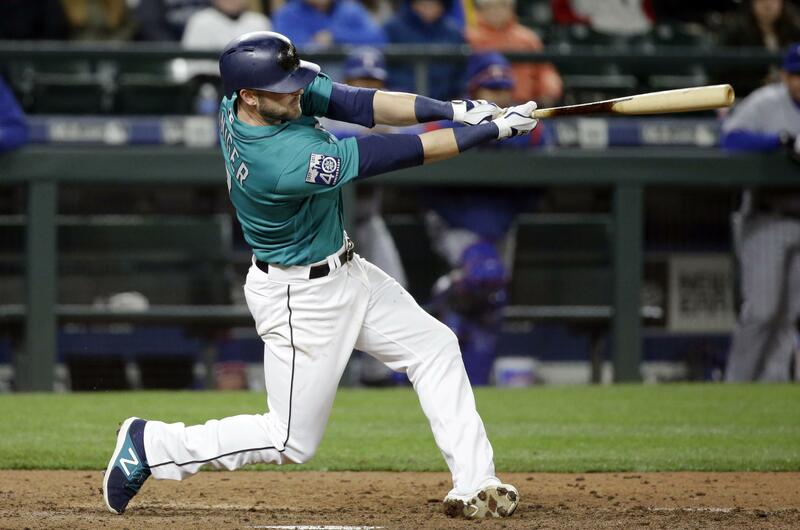 Mon., April 24, 2017, 11:55 a.m.
Seattle Mariners rookie outfielder Mitch Haniger was on base four out of five trips to the plate in Sunday’s breakout 11-1 win over the Oakland Athletics. If you’re reading this, it comes as no shock to you that the M’s team MVP so far this season has been Haniger, the “thrown in” player in an offseason deal which brought shortstop Jean Segura to town in exchange for starter Taijuan Walker from Arizona. All Haniger has done since he pulled on an Mariners uniform is hit: .312 average, .430 on-base and 1.020 OPS. He went 3 for 4 on Sunday with a walk and three runs. He’s been on base ahead of the sluggers all season, and finally the big guys behind him in the order seem to be shaking out of their early-season doldrums. Robinson Cano is 11 for 31 (.354) in his last eight games with five walks, two homers and six RBIs, while Nelson Cruz is 12 for 29 (.413) with eight walks, two homers and nine RBIs in the same time frame. Of the big three, only Kyle Seager still remains cold as ice, but perhaps the hip soreness that limited him to one at-bat over the weekend has more to do with that that he or the team is letting on. Regardless, for the optimistic Sunday’s outburst will be looked at as a harbinger of better things to come. But it’s been coming for a little over a week now. And with Dan Vogelbach called up to replace the anemic Danny Valencia (and, in a way, the now-departed Leonys Martin) and the impending activation of Jean Segura on Tuesday from the disabled list, things can only continue to look even brighter on the horizon. One thing’s for sure. If they aren’t, GM Jerry Dipoto isn’t going to just sit on his hands and wait for it to get better. Published: April 24, 2017, 11:55 a.m.